2 Options below: Either pick your own flavors or we will select our favorites for you. Wow! 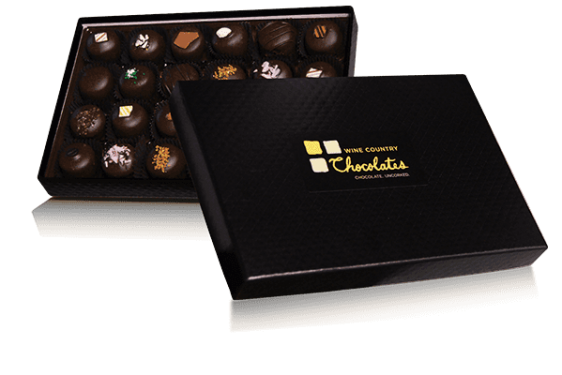 A large 24-piece box of our delicious, fresh chocolate truffles. You choose the 24 you desire or click on “An assortment of our favorites” and we’ll make a wonderful assortment for you. No preservatives or waxes, a fresh product made by us every day. Truly a wonderful gift for the chocolate lover! Have a look at our truffle flavors here. If you select the option below to choose your own truffles, a list of our truffle flavors will then appear for you to make your selections. To customize your twenty four piece truffle box, select how many of these truffles you’d like by clicking off this window. A dark chocolate truffle infused with sweet Italian Amaretto almond liqueur. Topped with a delicate almond sliver. It's an almond lover's escape to paradise. A luscious apricot puree is folded into our ganache to make this dark chocolate truffle. The fresh apricot flavor and supreme texture wows. Topped with a locally farmed apricot piece. A dark chocolate truffle infused with boysenberry puree topped with the perfect amount of local blackberry honey. 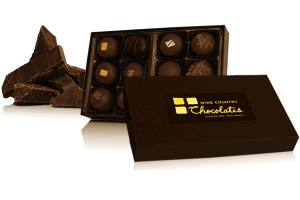 A dark chocolate truffle infused with a reduction of full-bodied Sonoma Valley Cabernet wine. It's a divine chocolate and wine experience. A dark chocolate truffle infused with the unbeatable combination of cappuccino and rum. We certainly know why it's a fan favorite! A dark chocolate truffle infused with locally hand-crafted sparking wine. It gives the chocolate a flirty effervescence that's consistently enticing. A dark chocolate truffle infused with slightly spicy cinnamon, and topped with beautiful locally produced clover honey. A dark chocolate confection filled with a coconut crme and coconut flakes. Sometimes the original is all you need. A dark chocolate truffle sans infusion of any flavors. A dark chocolate truffle infused with sweetened milk and topped with ultra creamy caramel. A dark chocolate truffle infused with banana extract and topped with creamy peanut butter. Elvis would have loved this stellar combination of flavors! Chewy crème caramel enrobed in our 61% dark chocolate and topped with a generous pinch of sea salt. Those “in the know,” are glad that they are! A dark chocolate truffle infused with French roast coffee. It's an incredible chocolate and coffee experience with a delightful balance of bitter and sweet. A dark chocolate truffle infused with a vibrant orange puree and fresh squeezed juice. It is an excitingly bright citrus and chocolate pairing. A dark chocolate truffle infused with pure hazelnut extract for a familiar and smooth chocolate combination. Topped with small hazelnut pieces. A dark chocolate truffle infused with rich Kahlua and classic Bailey's Irish Creme. It's like a sweet Irish coffee in one succulent bite! A dark chocolate truffle topped with a sweet and tart lemon curd. Wildly delicious. A milk chocolate truffle infused with malted milk for a sweetly nostalgic flavor pairing. A dark chocolate truffle infused with a natural peppermint oil, for a vivid mint and chocolate experience. A dark chocolate truffle infused with bright raspberry puree and topped with creamy peanut butter. It’s a playfully delicious treat. A heart-shaped dark chocolate confection filled with sweet, creamy peanut butter. A dark chocolate truffle infused with tart pomegranate puree and topped with a sweet, slightly floral local orange blossom honey. A dark chocolate truffle infused with sweet dessert Port. The perfect finish to any meal. A dark chocolate truffle infused with a fresh raspberry puree. It's perfectly sweet with a velvety texture. A milk chocolate truffle filled with seductively sweet strawberry infused ganache. This is a fun flavor blast truffle beautifully decorated with a delicate pink cocoa butter transfer. A dark chocolate truffle infused with a reduction of bold and spicy local Zinfandel wine. This pairing is almost too good to be true. All of our truffles are made with fresh cream and butter. Best enjoyed within three weeks. Box color may vary. Our Favorites or Select Your Own Truffles. Once you have picked the 24 truffles you would like in your Truffle box the add to cart button will appear at the bottom. A dark chocolate truffle infused with sweet Italian Amaretto almond liquors. Topped with a delicate almond sliver. It’s an almond lover’s escape to paradise. 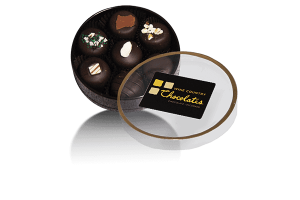 A dark chocolate truffle infused with a reduction of full-bodied Sonoma Valley Cabernet wine. It’s a divine chocolate and wine experience. A dark chocolate truffle infused with the unbeatable combination of cappuccino and rum. We certainly know why it’s a fan favorite! A dark chocolate truffle infused with locally hand-crafted sparking wine. It gives the chocolate a flirty effervescence that’s consistently enticing. A dark chocolate truffle starring intensely dark and crunchy pieces (nibs) of cacao beans folded into our ganache. A dark chocolate confection filled with a coconut crème and coconut flakes. A milk chocolate truffle infused with Creamy milk chocolate inspired by the internationally enjoyed dessert. A dark chocolate truffle infused with French roast coffee. It’s an incredible chocolate and coffee experience with a delightful balance of bitter and sweet. A dark chocolate truffle infused with rich Kahlua and classic Bailey’s Irish Creme. It’s like a sweet Irish coffee in one succulent bite! A dark chocolate truffle infused with a fresh raspberry puree. It’s perfectly sweet with a velvety texture. You've picked too many lovely Truffles, we understand why but you'll need to select less or chose a bigger box! The Add to cart button will appear once the total of 24 truffles have been selected.